whenever my life chose to give me a licking. The prompt word today is luck. This entry was posted in Good luck, Judy Dykstra-Brown poems, Poetry, Uncategorized and tagged Daily Post, Daily Prompt, good fortune, I Ching, image of Tarot Cards, Luck, Poetry, rhymed poetry on March 17, 2017 by lifelessons. 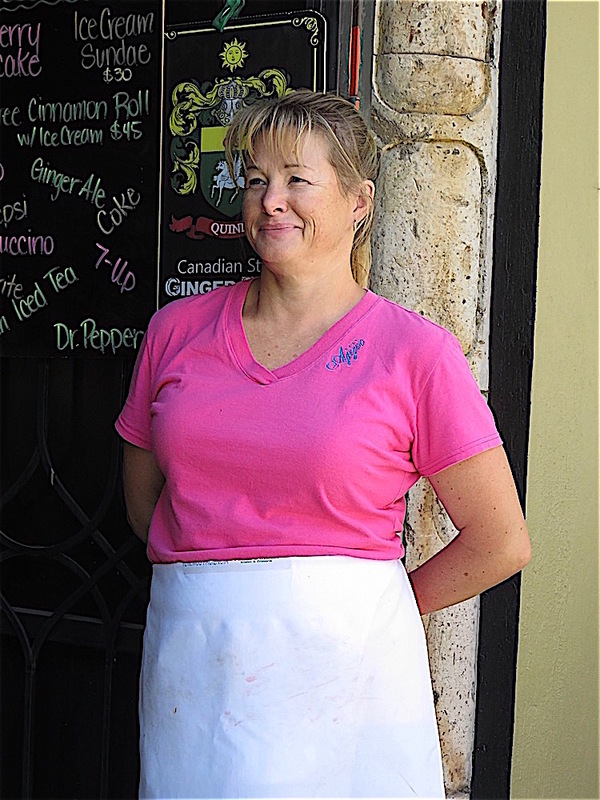 Hope wears a white apron and a pensive smile! I hope life turns out as you wish and is a bowl of cherries. I hope you find a run of luck and that it never varies. Every line would catch a fish. All orphans would find mothers. All endings would be happy. All lottery tickets win. But as I stop to think of it, I have to think again. If all of us were winners, winning would lose its distinction. Every hunter bagging game would lead to their extinction. It seems that often one guy’s luck brings bad luck to another. If you’re the family favorite, then it cannot be your brother! I hope that when it is your turn, good luck will come your way! Now I have to tell the story about my camera, which showed up missing (oxymoron) the day after I’d met friends in the Ajijic plaza coffee place. I’d run a number of errands that day, and so after I had searched my house for over an hour, and my car, and my garden, I headed off for town. Was it at the coffee place? No. Either of the stores I’d visited? No. I headed down the street to Ajijic Tango, where I’d had comida with my friends. All locked up. Seeing a door ajar a few yards away from the entrance, I called into it. It must be the kitchen. I called and called and fially someone came. I gave them a note asking the owner to call me.Then I went home. A day or so ago I wrote about a friend in Missouri who tends to straighten out my life for me on a regular basis? Well, I wrote to him bemoaning the fate of my camera. Within the hour, he had sent me a link to a local message board and lo and behold–there was a picture of my living room with friends I’d invited to a viewing of the new documentary of another friend all sitting in it! A picture that had been in my camera! Turns out the lady pictured above had been approached by a man who tried to sell her a camera. “He asked too much” she said in her message, which stated that when she’d inspected the camera, she had surreptitiously removed the sd card from the camera as well as three more in the pouch of the carrying case, then posted one of the pictures on the card in hopes of finding the owner. Did she know the man who had the camera? She did. Long story short, she went to his house to ask about the camera. Sadly, he reported, it had stopped working. (He still didn’t realize she’d taken the sd cards out. Brilliant move on her part.) Did he still have the camera? No, he had given it to his son, who, it turned out, worked in the restaurant next to where I must have lost my camera! After a few more trips to enquire on her part, the next morning I recovered my camera from the son, giving him a good reward, although he didn’t ask. I then recovered my four sd cards from the angel pictured above and gave her a reward as well, in spite of her protests. And that is how my Music Man in Missouri once more came to my aid and turned disaster into luck. (If you regularly read my blog, you might have guessed that I cannot survive without my camera.) What does this story have to do with hope? Simply that I hope if you ever lose anything dear to you that you have two angels looking over you as I did!!! This entry was posted in Good luck, Judy Dykstra-Brown poems, Poem, Poems, poems, Uncategorized and tagged Daily Post, Daily Prompt, Good luck, hope, poem about good luck on May 4, 2016 by lifelessons.